When you hear of the medical condition military neck, you may tend to think it is a casualty of military personnel. It refers to the physical condition of the cervical spine, also known as cervical kyphosis. If you have the posture of a completely straight neck held high and still, you may have this condition. Several factors are at the cause of military neck, and fortunately, it can be corrected. We will discuss the underlying causes of cervical kyphosis, and how experts suggest realigning the spine. What Is Military Neck (Cervical Kyphosis)? Military neck, or cervical kyphosis, refers to an abnormality of the cervical spine. Our cervical spine consists of the first seven vertebrae of our spine, beginning at the base of the skull, and running to the thoracic spine. The cervical spine is C-shaped, allowing us to turn and move our head up and down. Cervical kyphosis forces the cervical spine to sit straight, or in a backward bend. Both children and adults can suffer from cervical kyphosis as a result of several factors. Degenerative disc disease refers to a shift of the soft discs between the bones of your spine, and is not a disease so to speak. These discs allow the spine to move and bend. This condition can appear when the discs become thin over the years, and eventually give way. Over time, the neck and head will tilt forward. A form of cervical kyphosis can be developed in the womb, and may be apparent at birth, or not until adolescence. Some cases are even seen through imaging before birth. This birth defect can lead to abnormal growth of the spine, where the vertebrae creates a triangle shape with the spine, and forms a forward-shaped curve. This condition may also lead to other developmental deficiencies with the renal system, affecting the kidneys, bladder, ureters, and the urethra. Sometimes, the best intentions, such as a surgery or medication, can unravel and cause a health condition to worsen. Iatrogenic disorder is common with corrective surgeries such as laminectomy, a procedure to release pressure on the spine. Injury to the cervical spine as a result of a fall, contact sport, or an auto accident can lead to cervical kyphosis. A fracture or tearing of the ligaments can cause the cervical spine to curve forward, and may lead to the spinal cavity to narrow. Compression from pressure can cause pain, numbness, and muscle weakness. 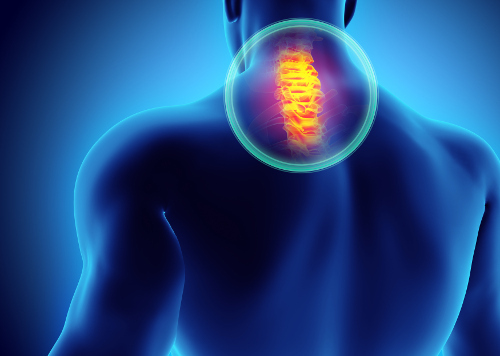 With cervical kyphosis cases that present pain and a slight curvature, physical therapy, a neck brace, and ways to relieve pain may be recommended by your medical professional. Cervical kyphosis treatment can alleviate many symptoms. In cases where compression or pressure on the spine exists or the condition worsens, patients may need surgery as form of treatment. Physical therapy is usually used with any spine surgery. The surgery may involve insertion of a metal rod or plate to support the spine, or to manipulate the vertebrae of the spine. Treatment of a military neck can take time, and there is no guarantee the patient will have the same neck position as they did before the condition. In addition to corrective medical procedures and pain medication, there are three main treatments to help correct the problem. By performing specific exercises, you may be able to regain normal curvature. This would focus on strengthening the neck muscles. A physiotherapist applies techniques to extend the neck in order to reverse the abnormality of the condition. This will also help to alleviate any discomfort and pain. You may improve the condition with the use of a unique pillow designed to correct the improper neck position. There are exercises you can do to relieve the pain and discomfort, and improve spine curvature in the comfort of your own home. As you stretch your body with yoga poses, you are able to lengthen the shoulders, neck and upper back, as well as help readjust the vertebrae. Poses to focus on include the Hand-to-Foot pose, the Gorilla pose, the Standing Wide-Leg Forward Fold pose, and the Seated Forward Bend pose. While sitting in a chair, tuck your chin under as far as you can without pain. Then, move your head forward from this position, as if you are touching the chest. Return your head to regular position, and then bend it back as far as you can. Repeat this five times each day. You can do this exercise while sitting or standing. Without rotating your neck, move your left ear towards your left shoulder. Stay in a comfortable position for 15 seconds. Repeat this on the right side. Complete this five times each day. Again, while sitting or standing, turn your head to the right as far as you can, trying to have your chin touch your right shoulder. Hold this position for 15 seconds. Repeat it on left side. Do this five times each day. The military neck condition may bring a smile to your face because of the name, but dealing with this condition daily is nothing to laugh at. It can present pain and hardship on the sufferer. There are non-surgical treatments some people may be able to perform at home to improve their condition. Severe cases may require surgery to try to correct the abnormal curvature of the cervical spine. “Cervical Kyphosis,” University of Maryland Medical Center; http://umm.edu/programs/spine/health/guides/cervical-kyphosis, last accessed March 30, 2017. “Military Neck Symptoms: What are its Causes & How to Correct it?” Tandurust, June 18, 2014; http://www.tandurust.com/fitness-and-exercises/military-neck-causes-how-to-correct.html, last accessed March 30, 2017. Pathak, S., “Exercises for Kyphosis and Lordosis of the Neck,” Livestrong, November 9, 2015; http://www.livestrong.com/article/503157-exercises-for-kyphosis-and-lordosis-of-the-neck/, last accessed March 30, 2017.